Sep. 10, 2015 Tags: Sarita's Word. I read this article and wanted to share it with you: 11 Things That Happen When You Read to Your Child https://blog.sonlight.com/11-things-that-happen-when-you-read-to-your-child.html. It's just plain fun to read a great story to children. When you stop at a cliffhanger they can't help but beg to know what happens next. But aside from fun, what good does reading out loud do? New research (such as the studies in this fabulous article) continues to confirm what we’ve known all along. Reading together does wonders for children. As you dive into your Sonlight this year, you'll spend hours sharing gripping stories with your kids. In case you ever wonder if it's all worth it, I've compiled a partial list of the wonderful benefits that reading aloud bring. Enjoy! When you read out loud to your children, you help them enjoy stories far beyond their own reading abilities. Whether children even know the alphabet yet, they can tag along on thrilling adventures and learn that books are a true treasure. 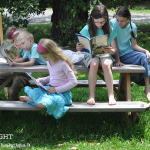 Time and time again, Sonlight families discover that reading aloud instills a love of books. After all, who doesn't love to hear a good story? An exciting new study compared children ages 3-5 who had heard many read-alouds with children who hadn't. The study put children in brain imaging equipment and then had someone read a story to them. The children whose parents had read a lot to them showed significantly more brain activity in the visualization section of the brain when they heard the story. Even though they couldn't see the pictures in the book, they could visualize what was happening. Children who hadn't been read to much had much less activity in this area of their brain when they heard a story. As one researcher said, "This brain area is 'a watershed region, all about multisensory integration, integrating sound and then visual stimulation.'" 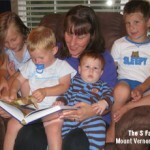 So reading to your children seems to develop key areas of the brain! Studies have also shown that reading good literature helps people become more empathetic. When you read the Sonlight Read-Alouds to your children, they get daily practice walking in other people's shoes, as they follow the inner thoughts and experiences of characters very different from themselves. As studies suggest, reading helps us imagine what other people are feeling. What a vital life skill! Children need to hear and read many, many words in order to develop the vocabulary they need to be well-educated. The English language has far too many words to learn through regular conversation alone. But as studies have shown, listening to TV or the radio doesn't build young children's vocabulary. Reading and listening to books read in person, however, do build vocabulary. And not only that, but even children's books contain a much wider range of vocabulary than normal conversation between two college-educated adults. I believe that reading (and listening to others read) often and widely is the only way children will develop a truly robust vocabulary. 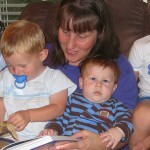 Reading aloud with your children also has an obvious benefit: they learn the content that they hear. This reality is at the heart of Sonlight's approach. When children learn about history and other cultures in the context of a good story, they enjoy it and they remember it. Now that's something I doubt you could say about textbook learning. As children learn about history through biographies, historical fiction and story-based history books (such as A Child’s History of the World), they form a picture of what life was like at various times and places in history. They remember significant historical events because they've formed an emotional connection to characters who lived through them. They know more than just facts and dates; they understand why and how things happened as they did. Understanding information that you hear is a critical skill in life. Reading out loud develops that skill in a natural and pleasant way. When children hear stories, they learn to translate words into meaning. That helps them in so many ways, and is a vital part of reading comprehension when they read on their own. Reading together helps you have meaningful conversations with your children. Consider those sticky topics that you know you should talk about with your kids, but you're not sure how. Reading together eases you into that. When you read Roll of Thunder, Hear My Cry, for example, you see discrimination first hand and can talk about the effects of racism on the main character's family. Your children want to ask you about relationships, money, poverty, war, and other uncomfortable topics. Reading real books together helps you be a huge influence in how they think about these things ... instead of letting them get all their information from their peers or mass media. As you read with your children, their attention spans will lengthen. In a world so full of distractions, the ability to focus on one task will be a huge advantage for this next generation. Even if children are playing quietly with something else while you read, their attention is set on that one story, instead of jumping from Facebook to Twitter to their latest text message. This ability to stay on one task is a vital skill in today's world. Reading out loud naturally helps children gain worthy role models and learn what good character really looks like. Life isn't always black and white, and kids learn from the characters they meet in books who make good decisions, and who face consequences and grow from their bad decisions. When you read these books together, you can naturally talk about similar things your own children may be struggling with. The books you read help you discuss real-life scenarios with your children so they can truly grasp what virtue looks like. In this way, I think Sonlight's literature-based approach is far more effective at forming character in the real world than moralistic tales or "character-training" curriculum. Relationships are built on shared time and shared experiences. Reading together gives you both. You get to fill up your children's "love tanks" with the love languages of physical touch and quality time. You create a reservoir of shared adventures to reference in your family culture, such as inside jokes or cultural references from books you've shared. And as every parent who has read a bedtime story knows, [these benefits of reading aloud are] all happening in the context of face-time, of skin-to-skin contact, of the hard-to-quantify but essential mix of security and comfort and ritual. So here's to a wonderful homeschool year full of beneficial Read-Alouds. Here's to helping our kids grow intellectually and emotionally, all while building family bonds. I trust that God will richly bless your times of sharing stories together. Thank you for the encouragement. It takes a lot of time and energy to do all that reading,but I am seeing the fruit of the benefits you speak of as we enter our fifth year of doing this. It is a precious time together.